We have been working around the clock to create some of the best events for all our community members. We have also been part of some of the most amazing EdTech events across the globe. Here a list of a few to show our work. EdTechReview hosts the 20th K12 Conference at Bangalore in Sept 2019. EdTechReview hosts the 19th K12 Conference at Delhi in Sept 2019. EdTechReview hosts the 18th K12 Conference at Chennai in Sept 2019. EdTechReview hosts the 17th K12 Conference at Pune in Aug 2019. EdTechReview's 7th edition of the ever successful HE Conference. For the always excited audience, EdTechReview announces the start of the 2019 HE Conference series at Bangalore. Starting off 2019 with the 2nd edition of Startup & Investor Summit and Expo 2019, EdTechReview aims to keep 2019 another happening year with more valuable events coming ahead. EdTechReview expands the HigherEd conferences to Pune this year as its 6th edition. Media partner at Terrapinn’s 2018 conf. Spread over 4 days, EduTECH Asia 2018 is one of the largest EdTech conferences in Asia. Featuring pre-event workshops, conference and exhibition and school tours, it is something you can’t afford to miss. So stay connects with us and stay updated for the latest news from EduTECH Asia 2018 – Singapore. EdTechReview hosts the 16th K12 Conference at Bangalore in Sept 2018. Just like for Delhi K12 Conference trend, EdTechReview continues with 2018 Bangalore edition as well. EdTechReview hosts the 15th K12 Conference at Delhi in Sep 2018. Keeping up the trend and need of the hour, EdTechReview continues to host the 2018 Delhi edition. After adding Pune and Hyderabad to our K12 Conference Series in 2017, EdTechReview announces Chennai as the newest venue for its 2018 K-12 conference series. EdTechReview returns to Pune after the unparalleled success of the 2017 K12 series. After an astonishing response at the HigherEd Bangalore 2018 conference, EdTechReview brings the 5th edition of the annual Higher Ed Conference Delhi, 2018. As Global Mindset organizes its 25th Workshop and Conference on the Emerging Trends in Living, Learning & Working; EdTechReview shall keep its readers updated with the latest from Rydges Sydney Central Hotel. With the grand success of the 2017 edition of the Higher Ed conference, EdTechReview takes the 4th Edition of Higher Ed Conference 2018 to South. EdTechReview takes the Startup & Investor Summit 2018 to Bangalore. Not to mention that K12 education is important and China is thought to be a closed market, here we are with the Annual International School conference from Shanghai, China. China is growing fast and the education is booming and we are glad to bring you the EdTech updated from Shanghai, China so you don’t miss how China is transforming. The 5th Annual Educon Asia includes 9th Annual Higher Education Summit Asia, Digital Learning Summit & Education Facilities & Infrastructure and EdTechReview is connecting you directly with the event updates. IQPC gets EdTechReview on board yet again to push the 3rd Next Generation Learning Spacing 2017 - Singapore - to spread the word across the global global EdTech community. With the grand success of the 2016 edition of the K-12 conference, EdTechReview takes the 8th Edition of K-12 Conference 2017 to Delhi. With the grand success of the 2016 edition of the K-12 conference, EdTechReview takes the 7th Edition of K-12 Conference 2017 to Bangalore. With the grand success of the 2016 edition of the K-12 conference, EdTechReview takes the 6th Edition of K-12 Conference 2017 to Hyderabad. With the grand success of the 2016 edition of the K-12 conference, EdTechReview takes the 5th Edition of K-12 Conference 2017 to Pune. 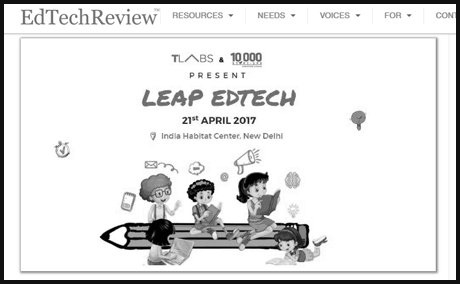 EdTechReview partners and bring the LeapEdTech 2017 by TLABS and 10000 STARTUPS to the community. The India Content Startup Conclave 2017 brought unique opportunity for Entrepreneurs - Content Providers (User Generated/ Professionally generated content, Tech Media & Content Media) and Investors to connect and talk about funding & build a community of potential investors, customers, business partners and fellow entrepreneurs all across the country. With the grand success of the 2016 edition of the Higher Ed conference, EdTechReview takes the 3rd Edition of Higher Ed Conference 2017 to South. With the success of spreading the word throughout the global community, IQPC partners with ETR to bring the 2017 edition of Higher Ed Asia Summit to the global level. Yes Institute brings the EdTech Experts – “EdTechReview” on board to get their EdTech Event across to the community. With the ever-demanding Early Education Technology and the changing ecosystem, ETR to host the 1st National Early Education Conference 2017. As always, being the part of the community, ETR partners with and brings VCCircle’s Education Summit 2016 to the community. EdTechReview takes Indian Experts and Leaders to the EdTechXAsia 2016 organized at Singapore with exclusive panel discussion lead by EdTechReview about Indian EdTech. MangaHigh – a GBL match platform launched a Diwali Math Competition in India in partnership with EdTechReview. In a span of just 45 days, it saw acceptance by over 100+ schools showing the immense success of the platform. With the concept of TED Talks but focused on for India, ETR partnered with JoshTalsk 2016 that was held at Delhi and features some amazing speakers discussing and sharing stories to change the world. EdTechReview brings the Online & e-Learning Summit Asia 2016, organized by IQPC on 18th to 20th October 2016 to the EdTech Community from Kuala Lumpur, Malaysia. ETR proudly bought the Nasscom Social Innovation Forum 2016 to the education community as it talked & explored about the impact of ICT in various sectors including Education. Following the ever successful and demanded ELC, EdTechReview organized the 6th edition of its K12 Conference at Bangalore a week after the Delhi edition. Formerly known as ELC, EdTechReview organized the 5th Edition of its K12 Conference at Delhi followed by the 6th edition at Bangalore. EdTechAsia organized its 1st conference at Bangkok, Thailand focused on to highlight Regional Education Focused Startups and Investors. EdTechReview was proud to be part of the conference. CSK brought the concept of TED Talks to reading though “READ Talks”, an event organized under the READ Alliance to improve reading skills of children (primary age) and ETR partnered with CSK to spread the work to the community. Terrapinn extends partenrship invite to ETR for 2016 its event. ETR takes the HETC 2016 big this time with over 250 participations. ETR bring the China's Biggest 2016 EdTech Events to the world from 1st 2016 global event from Shanghai, China. EdTechReview joins the crew at IEIC 2016, an important event, led by the Federation of Indian Chambers of Commerce and Industry (FICCI), to showcase the best of Indian edtech in Europe by bringing together educators, learning and education providers, edtech, investors and policy makers from India and Europe.